Sublime Mozart was dedicated to Australia’s greatest arts patron, Dame Elisabeth Murdoch, AC, DBE, in celebration of her 100th birthday. With superb Australian clarinettist and distinguished Mozart performer Paul Dean, the Grainger Quartet, The Queensland Orchestra and Guillaume Tourniaire, these fresh, new performances make these masterpieces of classical music sound newly minted. Using the latest direct stream digital technology, these world-class performances are presented in the finest SACD sound reproduction. The Ken Cato design and elegant packaging complete this very handsome release. Sublime Mozart has been produced with the assistance of the Australia Council. There’s no doubting the fondness Mozart had for an instrument he first came across when copying out one of C.F. Abel’s symphonies while in London in 1764. He would first make use of the clarinet in his Divertimento, K113 for strings, two clarinets and two horns; his first use of clarinets in an opera is in Idomeneo, written in Munich in 1781. He would, of course, make extensive use of them in his serenades, concertos and symphonies, but it would take a virtuoso of the likes of the Austrian clarinettist and basset-horn player Paul Anton Stadler (1753–1812) to inspire him to write two of his greatest masterpieces. Many of Mozart’s finest works have been inspired by the talents of friends – just think of Ignaz Leutgeb (c1745–1811), the Austrian horn player for whom he wrote his four Horn Concertos. Or Aloysia Lange nee Weber (c1761–1839), with whom Mozart was madly in love. He later married her sister Constanze, but did write seven magnificent concert arias for this talented soprano. Despite the occasional disagreement, Stadler would remain Mozart’s life-long friend. A member of the Vienna court orchestra along with brother Johann, Stadler’s speciality was playing in the lower (chalumeau) register of the clarinet; this led him to develop, along with Theodor Lotz, the basset clarinet, which extended the range of the instrument downwards by four semitones. It was for this instrument that Mozart wrote the two works on this disc, which are now normally played on the standard clarinet in A. The Clarinet Quintet in A, K581 was completed in September 1789 and is thus contemporaneous with Mozart’s opera Così fan tutte (1789). The Quintet's first performance was given on 22 December 1789 by Stadler; the first violinist in the string quartet was the virtuoso Joseph Zistler. Mozart’s Clarinet Concerto in A, K622 was finished on 7 October 1791, only two months before the composer’s untimely death. Neither the original manuscript nor Stadler’s basset clarinet has ever been found. Aside from these two works, Mozart also wrote for Stadler the ‘Kegelstatt’ Trio in E flat, K498 for clarinet, viola and piano (1786) and two fine obbligato parts in his 1791 opera La Clemenza di Tito, written for the coronation of Leopold II in Prague. 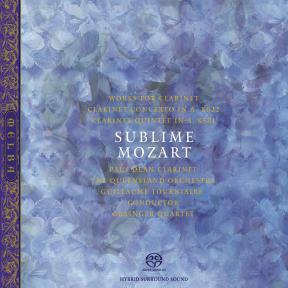 Sextus’ Act One aria ‘Parto, ma tu ben mio’ features the basset clarinet; Vitellia’s Rondo ‘Non piu di fiori’ features an obbligato for basset horn in F – an instrument the dark qualities of which Mozart also exploited in many other works, including the Requiem, K626. The other major influence on Mozart’s compositional style was his role as a Mason. The Freemasons are a philanthropic, humanitarian and rational order that have their origins in the 14th century, during which time stonemasons could identify each other by means of secret signs. The first Grand Lodge was established in London in 1717 and its ideas subsequently spread to Europe. Mozart was initiated into the Lodge on 14 December, 1784, Stadler soon after (as was Mozart’s father Leopold). It is worth noting that in Mozart’s concertos from this point on the orchestra would converse more easily with the soloist through duo and concertante passages rather than merely accompanying – perhaps an immediate influence of the Masonic idea that music should encourage unity. Mozart did write many works explicitly for use in Masonic ceremonies: the beautiful Maurerische Trauermusik (Masonic Funeral Music), K477 is the most famous example, while Mozart’s last completed work, written in November 1791 for the inauguration of a Masonic lodge, was the cantata Laut verkünde unsre Freude. Then there is that masterpiece that stands midway between the esoteric and the popular, the heavily allegorical Singspiel Die Zauberflöte (The Magic Flute), which was written to a libretto by theatre director and fellow Mason Emanuel, Schikaneder. But much of Mozart’s instrumental music is imbued with Masonic symbolism. The Piano Concerto in C, K503 has clear Masonic resonances, as does the ‘Jupiter’ Symphony, K551. Both works are in C major, a key that represents ‘light’ as opposed to the ‘dark’ of C minor. There are also chamber works like the final string quintet in E-flat major (the key of The Magic Flute overture) and the A major Clarinet Quintet; the key signatures of each feature three signs – three flats and three sharps respectively. These ideas of light versus dark and the symbolic value of three – the perfect number according to Pythagoras, but also representing Body, Mind and Spirit and Faith, Hope and Charity – were further extended to musical devices. For example, consonant intervals like thirds and sixths symbolised harmony, seconds and sevenths, as well as chromatic writing, discord; dotted rhythms symbolised courage; slurs or suspensions represented links between brethren. It is often difficult to distinguish deliberate Masonic symbolism from normal classical practice in Mozart’s music, since many of the concepts overlap (order, balance, symmetry, etc). But in works like the Clarinet Quintet and the Clarinet Concerto, again in A major and using an instrument that was much favoured for Masonic music, there seems little value in doing so: like J.S. Bach, Mozart would hardly have separated art from life; his beliefs would have saturated every aspect of his craft, whether deliberate or on a subconscious level. Thus it is that the solemn opening of the quintet’s Allegro immediately recalls Zorastro’s aria from The Magic Flute, ‘In diesen heil’gen Hallen’, while the use of arpeggio figures (especially in the pizzicato cello) throughout recall the sacred ‘three’. Both the Larghetto and the Menuetto with its two trios are in three-four time, while the five variations of the Allegretto con Variazioni condense the ideas of conflict and transformation familiar in The Magic Flute. Like the Quintet, the first theme of the Clarinet Concerto begins with a descending minor third, while the overall structure of the movement, with its ritornelli separated by a development and recapitulation, is again analogous to Masonic ideas of circularity and a movement from ignorance to enlightenment through trial. In fact, this is true of virtually any of Mozart’s works that employs the sonata principle with its basic tripartite structure of exposition, development and recapitulation. This makes the significance of the ABA ternary structure of the following beautiful Adagio obvious, while the concluding Rondo: Allegro, with its more overt virtuosity and contrasting moods moves through a shadow-lapped landscape before ending in radiant joy. This recording is dedicated to Dame Elisabeth Murdoch AC, DBE, on the occasion of her 100th birthday 8th February, 2009. Dame Elisabeth is the Founding Benefactor of the Melba Foundation.